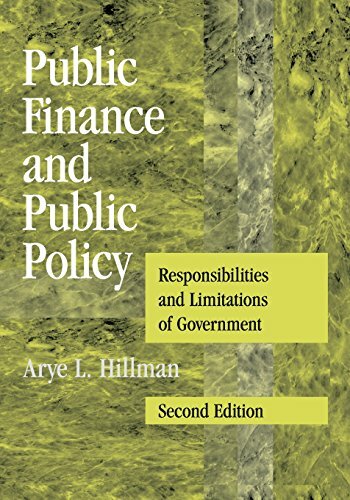 [PDF] Public Finance and Public Policy: Responsibilities and Limitations of Government | Free eBooks Download - EBOOKEE! Description: This book is the second edition of Public Finance and Public Policy (2003). The second edition retains the first edition's themes of investigation of responsibilities and limitations of government. The present edition has been rewritten and restructured. Public choice and political economy concepts and political and bureaucratic principal-agent problems are introduced at the beginning for application to later topics. Fairness, envy, hyperbolic discounting, and other concepts of behavioral economics are integrated throughout. The consequences of asymmetric information and the tradeoff between efficiency and ex-post equality are recurring themes. Key themes investigated are markets and governments, institutions and governance, public goods, public finance for public goods, market corrections (externalities and paternalist public policies), voting, social justice, entitlements and equality of opportunity, choice of taxation, and the need for government. The purpose of the book is to provide an accessible introduction to the use of public finance and public policy to improve on market outcomes. No comments for "[PDF] Public Finance and Public Policy: Responsibilities and Limitations of Government".